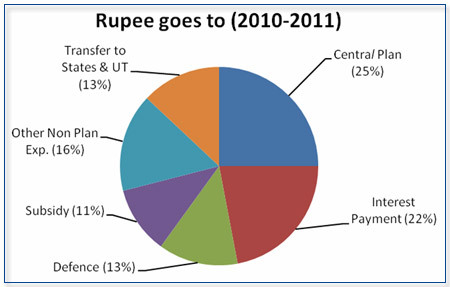 India's 2010-2011 budget of 11.08 trillion rupees ($240 billion) represents an increase of 8.6% over 2009-2010. The government plans to borrow $100 billion to finance the deficit during the fiscal year. Going forward, India plans to cut the deficit to 5.5 percent of gross domestic product in the year starting April 1 from 6.9 percent the previous year. The effort, which relies on tax increases and 400 billion rupees ($9 billion) of state asset sales, is aimed at shrinking a debt burden equivalent to about 82 percent of the GDP. The defense allocation for 2010-2011 is up another 8.13 percent on top of the massive 34% increase in 2009-2010, according to media reports. India's defense expenditure has been raised to Rs.147,344 crore (Rs.1.47 trillion/$32 billion) for 2010-11, up 8.13 percent from the revised estimates of the previous fiscal, in the budget presented by Finance Minister Pranab Mukherjee in the Lok Sabha today. According to the Wall Street Journal, India is one of the largest buyers of foreign-made munitions, with a long shopping list which includes warships, fighter jets, tanks and other weapons. Its defense budget is $30 billion for the fiscal year ending March 31, a 70% increase from five years ago. The country is preparing its military to deal with multiple potential threats, including conflict with China and Pakistan. "For 2010 and 2011, India could well be the most important market in the world for defense contractors looking to make foreign military sales," according to Tom Captain, the vice chairman of Deloitte LLP's aerospace and defense practice. In addition to defense, the much-needed social sector spending has also received a significant boost in the new budget. • The spending on social sector has been gradually increased to Rs1,37,674 crore in 2010-11, which is 37% of the total plan outlay in 2010-11. • Another 25% of the plan allocations are devoted to the development of rural infrastructure. • Plan allocation for school education increased by 16% from Rs26,800 crore in 2009-10 to Rs31,036 crore in 2010-11. • In addition, States will have access to Rs3,675 crore for elementary education under the Thirteenth Finance Commission grants for 2010-11. • An Annual Health Survey to prepare the District Health Profile of all Districts shall be conducted in 2010-11. • Plan allocation to Ministry of Health & Family Welfare increased from Rs19,534 crore in 2009-10 to Rs22,300 crore for 2010-11. With 4.57 trillion rupees (about $100 billion) budget shortfall, the Indian government plans record levels of borrowing next year and will count on surging economic growth to help cut its fiscal deficit, putting pressure on the Reserve Bank of India (RBI) to be more aggressive in its monetary tightening, according to Reuters. Interest rate hikes by the RBI will raise the cost of borrowing by the private sector companies, and hurt India's economic growth. Some analysts have praised the plan to reduce the fiscal deficit to 5.5 percent of the projected GDP in the new year from 6.9 percent of actual GDP this year, with further declines in planned coming years, and a RBI deputy governor said the budget addressed concerns on fiscal discipline. But other analysts said India had missed a chance to take more aggressive fiscal measures as Asia's third-largest economy gathers speed, reinforcing perceptions that the coalition government lacks the firmness to make tough decisions. On top of the union budget deficit of 6.9% of GDP, the gross fiscal deficit of state governments is budgeted to increase to 3.2% of GDP in 2009-10 (Budget estimates), compared with 2.6% of GDP in 2008-09 (revised estimates). Revenue account turned from a surplus of 0.2% in 2008-09 (RE) to a deficit of 0.5% of GDP in 2009-10 (BE), according to a study 'State Finances: A Study of Budgets of 2009-10,' released by the Reserve Bank of India (RBI). The study also noted that state-wise, revenue accounts of four states West Bengal, Punjab, Kerala, and Rajasthan recorded revenue deficits during 2008-09 (RE). Jharkhand turned from a revenue deficit to a revenue surplus state. In 2009-10 (BE), 10 states are expected to turn revenue deficit from a surplus status in the previous year. Overall, the revenue account is expected to be adversely impacted in the case of 23 states during 2009-10 (BE), the study noted. The debt-GDP ratio of state governments came down to 26.2% in 2008-09 (RE) from the peak level of 32.8%, at the end of March, 2004. However, outstanding debt is budgeted to increase marginally to 26.5% of GDP by end-March 2010. The XII Finance Commission had recommended that states achieve a debt-GDP ratio of 30.8% till the end of March 2010. In an opinion piece on Countercurrents, India's former commerce minister has said that Mukherjee "has failed to address the core issues of reducing public debt, curb the dangerously high fiscal deficit[ even the claimed target for 2010-11 of 5.5 per cent is too high, and will represent a huge diversion of funds with public sector banks away from private sector investment], and introduce innovation into the ailing industries such as Textiles, Food Processing, Power Generation and Distribution. Hence, despite his heroic effort to put together a promising Budget, he has at best produced a damp squib for financial reforms". Swamy is particularly concerned about India's growing public debt which is now "over 90% of GDP and on an exploding trajectory". Although rising public debt is always a concern, I think India's saving grace is that about 90% of its public debt is owed to its own citizens who save about 30% of their income. Of the rest, a big chunk of debt is held by IFIs like the World Bank, which, are not likely to press for quick repayment. At $230 billion, India's external debt accounts for 22% of GDP as of March 2009, according to Reserve Bank of India. In terms of the international comparison of external debt of the twenty most indebted countries, India was the fifth most indebted country in 2007. Swamy further said that the Indian "agriculture has been poorly performing since 2003 due to investment starvation and lack of adequate purchase price. Indian manufacturing sector unlike the Chinese’ is domestic demand driven. IT software giants were skillful in finding new markets and cheaper labor from tier II and III cities in India. All, no thanks to government". Members of the opposition in Indian parliament boycotted much of the budget session, saying government plans to increase fuel prices would further add to the woes of millions of Indians hit by high prices. 1.It is comfortable as long as we grow around 7% which seems very likely. 2.It is denominated in rupees and thus could be inflated away if worse comes to worse. 3.The government's stakes in corporations like SAIL,IOC,BSNL etc are worth around 3-4 years of such deficits. 4.GDP to debt ratio is lower than EU,US,Japan even though the economy is growing much faster. Well the latest Indian Budget proves to the world that that country is made up entirely of middle-class, rich and super-rich people. There are no hungry people, no slum dwellers, no unemployed, no poor. Everyone there has overloaded wallets! India's finance minister is seeking to please the middle classes with his latest budget. But his proposals may not address the needs of the underprivileged , says economic analyst Paranjoy Guha Thakurta. Budgets in India are much more than the statement of accounts for the world's largest democracy. As the finance minister, seasoned politician Pranab Mukherjee, said: "It has to reflect the government's vision and signal the policies to come in future." In this budget Mr Mukherjee has sought to roll back some of the fiscal stimulus measures introduced from late 2008 in the wake of the global economic crisis. The gradual withdrawal of economic stimulus packages was signalled by a 2% increase in excise duties (after they had previously been reduced by 6%). Taxes on petroleum products have also been increased. But instead of dampening expectations of lower prices, the budget may well stoke inflationary fires further. The official wholesale price index is currently going up by close to 9% at present. What is particularly troubling for India's poor is the sharp rise in food prices - the official index indicates that food price inflation has varied between 18% and 20% in recent weeks. The sudden jump in the price of specific food items is of particular concern. Sugar prices have nearly tripled over the last year, while potato prices have almost doubled. Prices of edible oils, pulses, fruits and vegetables have also increased substantially: varying between 20% and 40%. Even the annual "Economic Survey" released by the ministry of finance on Thursday, a day before the budget was presented, has all but acknowledged that poor management of supplies by various government agencies has contributed to high prices after 2009 witnessed inadequate rainfall. The survey optimistically projects that GDP growth will pick up from 8.5% to more than 9% over the next two years. Time will tell whether these projections are excessively optimistic or grounded in reality. The government concedes that much would depend on a favourable monsoon - even the finance minister prayed to Lord Indra, the Hindu god of rainfall, in his budget speech. India has to make provision for budget with the reality of neighbour around it. Otherwise lot of focus is given for inclusive growth after the thumb down was given by public of india for the bjp's india shining slogans. So all politicians knows where their mouth is. KARACHI, March 1 (Reuters) - Pakistan's budget deficit for the first six months of the 2009/10 fiscal year (July-June) was 2.7 percent of gross domestic product (GDP), the Finance Ministry said on its web site on Monday. This was within a target that the government and the International Monetary Fund (IMF) had set. The budget deficit for the first three months was 1.5 percent of GDP, which was 0.2 percent higher than the target of 1.3 percent. Pakistan pledged to keep its fiscal deficit at 4.9 percent of GDP in the 2009/10 fiscal year under a loan agreement with the IMF. Outgoing Finance Minister Shaukat Tarin said in January the fiscal deficit could rise to 5.3 percent of GDP. However, analysts said the deficit could be contained if sufficient external flows came in before the end of the fiscal year. see the positive side of india, every body is ready to give money to india. Even the so called gcc which were only investing in western world [ got half of their networth wiped off in sub prime asset ] is interested in investing in india. Prashant Bhushan alleged here over the week-end. organisations of the Maoists, he added. resulting in civil war, he added. terrorist. It is the ultimate repository of law and order. China plans to increase its defense budget by 7.5 percent in 2010, only about half of last year's planned growth of 14.9 percent, a parliament spokesman said here on Thursday. The planned defense budget is 532.115 billion yuan (about 78 billion U.S. dollars), a rise of about 37 billion yuan from last year's defense expenditure, Li Zhaoxing, spokesman for the annual session of the National People's Congress (NPC), told a press conference. Defense spending would account for 6.4 percent of the country's total fiscal expenditure in 2010, the same with last year, he said. However, Li stressed that the figures would not be final until the budget plan is approved at the NPC annual session due to open in Beijing on Friday. It is the first time for China's defense budget growth rate to drop to less than 10 percent in recent years which saw a row of consecutive double-digit increases. This year's increased budget will be mainly be spent to support the reform of China's military and improve its capability to deal with varied threats and complete diversified tasks, Li said. Part of the money will also be used to raise the living standards of servicemen, he said. China has always taken the road of peaceful development and keep in line with the defensive national defense policy, Li said. Taking into account China's large population, its vast territory, and its long coastline, the country's defense budget is "comparatively low," according to the former Foreign Minister. "China's defense expenditure in recent years accounted for about 1.4 percent of its GDP," he said, adding that the ratio was four percent for the United States, and more than two percent for the United Kingdom, France and Russia. He said China has been continuously raising its military transparency by submitting defense budgets to the NPC annual sessions for approval, issuing white papers every two years on its national defense, and establishing a spokesperson system and websites for its Defense Ministry. The Central budget of 2010-11 is a further step in the realisation of a vision of India vibrant with the income, wealth, saving, education and the entrepreneurial energy of the top 5-10 per cent of the population and the rest of Indians, serving that minority and surviving as barely literate, malnourished multitude. With the accession of Rajiv Gandhi to power, a vision began to germinate. That vision was that of an India that would be vibrant with the entrepreneurial energy of the few, and the rest of the population serving those few with their labour. Look at the successes of the budget: the professional middle class is happy with the cuts in taxes collected from it. The business community, including foreign investors, is happy, because of further privatisation of public assets by which the Finance Minister proposes to raise Rs. 25,000 crore, because of the looming privatisation of many operations of the Indian Railways, whose kitty is nowhere near what it should be for even partial implementation of the projects announced by the Railway Minister, because the FDI path would be further smoothed and because licences would be issued for fresh private banks. Never mind if they fail as the Global Trust Bank did, the government will pick up the bill directly or indirectly, in accordance with its earlier record and the recent practice in the United States and Britain where banks failed but bankers remained prosperous. The Indian stock market responded positively, thus sending a message of welcome to the budget and generating profits for the bulls. The Finance Ministers of the neoliberal Central government had earlier instituted the Fiscal Responsibility and Responsibility Management Act. This became their excuse to drastically cut down public investment and expenditure on the social sector. As soon as the global financial crisis hit India and the interests of the Indian rich demanded fiscal stimulus, the government overthrew fiscal orthodoxy and budget deficits soared. North Block policymakers can claim that the stimulus worked and the growth rates did not crash. The problem is with the content of that growth. The Union Cabinet recently approved an agreement with the U.S. on ‘Agricultural co-operation and food security.' Under an India-U.S. Agricultural Knowledge Initiative, multinational agribusiness firms such as Cargill and Monsanto can become members of the policymaking body. This is ironical since most of U.S. agribusinesses are conducted under the umbrella of huge government subsidies, while the current budget has cut the measly subsidies poor farmers enjoy in India. Indian agriculture has grown slowly in recent years, and food grain production has lagged behind population growth. Ordinary Indians are badly malnourished and calorie intake has fallen over time. An Expert Group appointed by the Planning Commission has proposed 1800 calories per day as the norm of consumption by an adult for fixing the poverty line. This norm is applicable only for light or sedentary work. How is a construction worker with heavy head loads or an agricultural worker driving buffaloes in a flooded paddy land going to do his work and lead a healthy life or survive long? Even this norm yields an estimate of poverty of about 42 per cent in 2004-05, much higher than the estimates quoted officially. If the Food Security Bill is passed by Parliament, it will presumably be implemented by accepting the older estimate or the new estimate of the Expert Group. Either way, a vast number of people who are malnourished will remain in that state. Around six out of 10 Indians live in the countryside, where abject poverty is widespread. 34.7 % of the Indian population lives with an income below $ 1 a day and 79.9 % below $ 2 a day. According to the India’s planning commission report 26.1 % of the population live below the poverty line. [World Bank’s poverty line of $1 a day, but the Indian poverty line of Rs 360 a month, or 30 cents a day]. “A major area of vulnerability for us is the high consolidated public-debt to GDP ratio of over 70 percent … (and) consolidated fiscal deficit,” says the Governor of Reserve Bank of India (RBI), Mr. Yaga Venugopal Reddy. The Human Development Report for 2009 released by the UNDP ranked India 134 out of 182 countries, working it out through measures of life expectancy, education and income. India has an emigration rate of 0.8%. The major continent of destination for migrants from India is Asia with 72.0% of emigrants living there. The report found that India’s GDP per capita (purchasing power parity) is $2,753, far below Malaysia’s $13,518. China listed as 92 with PPP of $5383. Read the statistics from UNDP website. According to the Indian census of 2001, the total population was 1.028 billion. Hindus numbered 827 million or 80.5 %. About 25 per cent (24 million) of those Hindus are belonging to Scheduled Castes and Tribes. About 40 per cent (400 million) are “Other Backward Castes”. According to the National Family Health Survey data (2005-06), only 45 per cent of households in the country had access to improved sanitation. Can a country where a third of the population is illiterate be an Information Technology superpower? Can a country where 78 million rural homes have never seen electricity be an economic superpower? Can anyone feel safe living in islands of prosperity in a sea of poverty? While India’s educated elite are reveling in their new found status on the global stage, inequitable distribution of wealth and opportunities are shaking the very foundation of India’s new economy. Will the Indian government’s apathy towards the rural poor bring India’s party to an abrupt end? In the last 12 years, India's economy has grown at an average annual rate of about 7 percent, reducing poverty by 10 percent. However, 40 percent of the world's poor still live in India, and 28 percent of the country's population continues to live below the poverty line. More than one third live on less than a dollar a day, and 80 percent live on less than two dollars a day. India's recent economic growth has been attributed to the service industry, but 60 percent of the workforce remains in agriculture. The rate of increasing disparity between the ‘haves’ and the ‘have-nots’, is hard to miss in tech centers like Bangalore, Chennai and Delhi. Technology professionals are returning, having made their millions in the US. They are driving expensive cars and living in luxury apartments. Cities are growing in all directions. Farmlands are being acquired to build luxury townships, golf courses, five star hotels, spas and clubs. Poor farmers get paid off, and are forced to move further away from the city. And while global leaders and businessmen wax eloquent about India’s growing status as an IT superpower, everyone turns a blind eye to the majority of the population untouched by the economic growth. And the scenario is not too different in smaller cities. Nagpur is a bustling metropolis in the heart of India, in a region known as Vidarbha. There are signs of economic boom everywhere in the city – shopping arcades, multiplexes, pubs, and luxury clubs. Yet, right outside the city, farmers are committing suicide due to their inability to repay debts as small as $100. In the last five years, almost two thousand farmers in the region have killed themselves. While, the government must own primary responsibility for social upliftment, the answer to India’s woes probably lies in a public-private partnership towards addressing India’s deprived poor. It’s happening in pockets. Companies like the Tata Group have ingrained social responsibility in their DNA. Azim Premji Foundation, promoted by the Wipro Chairman, is working with state governments to improve grassroots level education in rural India. What’s probably now needed is for all private enterprises and government bodies to collaborate, to create a larger, more meaningful, nationwide impact. Corporations should not view it purely from a philanthropic perspective. A bigger pool of educated and employable population will mean availability of better quality human resources. And a stable society creates a far more secure environment to do business in. Cleansing the environment where you are running your operations definitely makes better long term business sense. And the sooner corporations realize this, the better it is for everyone. The proposal to ease Foreign Direct Investment norms (although there were neither any concrete sector specific announcements, nor any timelines) is a welcome statement. The thrust on infrastructure, although expected, is definitely a big positive for an infrastructure deficit country like India. The budget will provide Rs1,735bn for infrastructure development, which is around 46 per cent of the total plan allocation for FY11. Further, allocation for road transport has been increased by over 13 per cent. There is an increased thrust on speeding up the expansion of new generation capacities. Plan allocation for power sector has been doubled to Rs51bn in FY11. Not that the infrastructure woes would be fully ameliorated, but at least the gap will be reduced. There has also been a clear announcement of a deadline for ensuring reforms of both the direct and indirect tax structures i.e. implementation of the Direct Tax code (DTC) and Goods & Services Tax (GST) by 1st April, 2001. Readers, though, would do well to remember that the deadline for the implementation of the GST has remained quite dynamic, the proposed implementation dates have been changing frequently over the years. Apart from that, there were some usual sound bites about focusing on the poor through investments in the social sector. The feel good factor, though, was the explicit talk about fiscal prudence as the budget talked about some specific numbers in terms of fiscal deficit, aiming to reduce it to 4.1 per cent by the year 2012-13 from the proposed 5.5 per cent for 2010-11. The market lapped it up and the Bombay Stock Exchange benchmark Sensex boomed. Therein, the good news ended. The statement about fiscal prudence, a highlight of this budget actually gives a sense of déjà vu. It is important to note that the Fiscal Responsibility and Budget Management (FRBM) Act was notified in July 2004, imposing strict fiscal and revenue deficit targets for the government, only to be held under suspended animation when things spiralled out of control a year down the line. It, therefore, remains to be seen whether the promise this time round can be kept. There have been umpteen examples of India frittering away its resources through unabashed wasteful expenditures. Revenue conservation has never been a hallmark of Indian policymakers (nay politicians). Even when the Gross Domestic Product was growing at around 9 per cent plus, increasing expenditure more than matched increasing revenue. The scenario this year is nothing new. Of the projected fiscal deficit of Rs3,814bn, the revenue deficit accounts for Rs2,765bn, which means that, nearly 72.5 per cent of the fiscal deficit is accounted for by revenue deficit. This means that, only a fourth of the government’s borrowing would be used for capital investment while the remaining three fourths will be utilized for the government’s housekeeping expenses. Not surprisingly, the debt service burden will continue to be a worry. And why not surprisingly? The budgeted gross interest payment at Rs2,487bn for the coming financial year, accounts for more than 65 per cent of India’s fiscal deficit. This means that the government needs to borrow a lot of money simply to meet its interest obligations. The inability of the government to reduce its wasteful expenditure, given the rampant corruption, has resulted in its increased dependence on disinvestments (targeted at Rs250bn during 2010-11) to meet its expenditure needs. Not that disinvestment is a bad policy. Indeed the government has no business to be in business. But this clearly reflects on the inability of the government to manage its finances appropriately. There is a limit to which the government can keep on selling its assets to finance its expenditure. And this budget, like all the previous budgets shows no intent to talk about provisions to reform the bureaucracy and tackle corruption. ...The composition of capital inflows shifted in favour of debt, with a rise in the proportion of short-term flows. If the pace of FDI inflows does not pick up once again and FII equity inflows revert to the decelerating trend, CAD may have to be largely financed through debt creating flows in the coming quarters. Recent pick up in FII flows has been mainly on account of investment in debt instruments. On the capital account, recent policy measures have stimulated debt capital flows in the form of investments by FIIs in debt instruments and NRI deposits. Going forward, however, it would be necessary to reduce dependence on debt inflows and accelerate the reform process in order to ensure revival of equity flows as investors look for strong growth opportunities in an otherwise gloomy global environment, the RBI says. Widening current account deficit (CAD), diminishing capital flows and moderately deteriorating vulnerability indicators, notwithstanding improved net international investment position, warrant acceleration of the domestic reform process. The RBI feels this will encourage renewed equity flows. Subbarao made it clear that close monitoring of the short-term external debt will be required in 2012-13. Given that both global and domestic scenario remains bleak, investors would generally tend to prefer shorter-dated government securities. * If the pace of FDI inflows does not pick up and FII equity inflows decelerate, CAD may have to be largely financed through debt creating flows in the coming quarters.